A participant holding up her design at Mark Pekala's Arlington Abstracted activation. 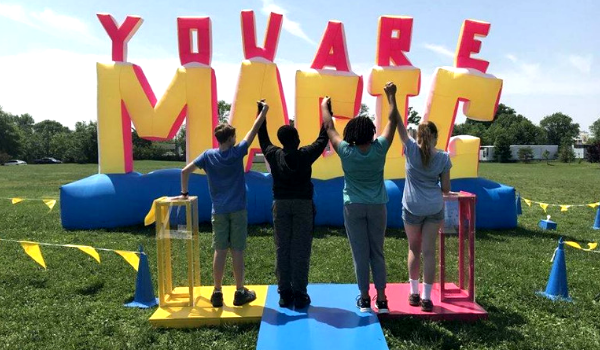 Friends activate the 14-foot "You Are Magic" inflatable sculpture designed by Alicia Eggert. 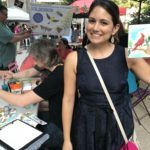 Over 1,200 original artworks were created as part of Kate Samworth's Going Native: Flora and Fauna of Arlington, Virginia activation. Participant creating his own soundtrack on Alex Braden and Emily Francisco's Bipedal Soundscapes. 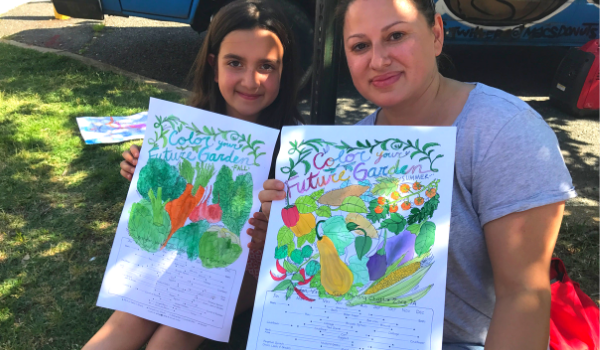 Mother and daughter duo show off their completed watercolors during the Color Your Future Garden by Marcella Kriebel. 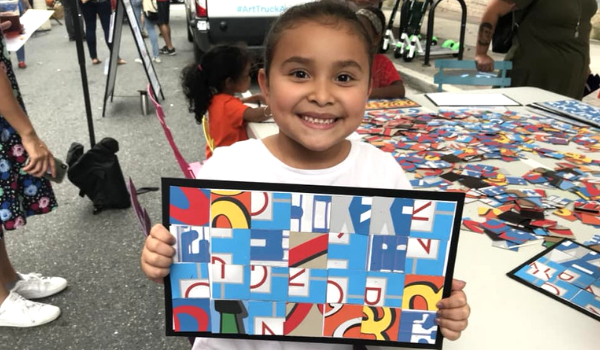 The Arlington Art Truck, funded partly by a grant from the National Endowment for the Arts, delivers cultural experiences to where you live, work and play and gives you a chance to engage with County and nonprofit initiatives in Arlington in a unique, fun way! 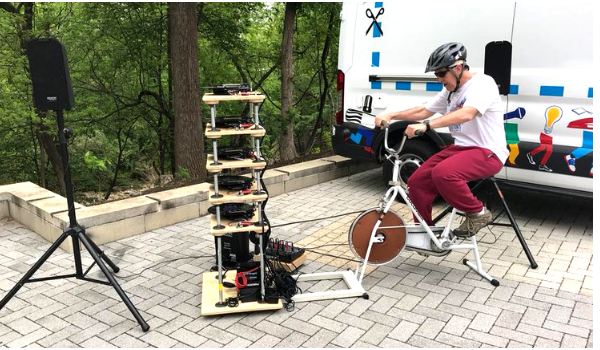 During the Art Truck season from April - November, artists-in-residence packed the van with projects ranging from interactive sculptures, installations, performances and more. 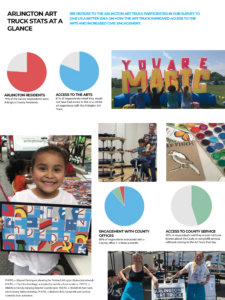 Each project was paired with a County or community partner so visitors can create or activate artworks as well as learn more about County and community resources. Learn more about our first season of the Arlington Art Truck below and click here for the current 2019 season. Bipedal Sounscapes created by DC area artists Emily Francisco and Alex Braden lets participants activate a sound sculpture. 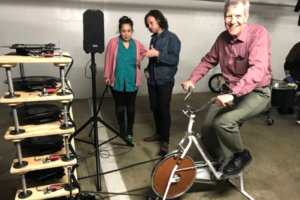 By pedaling a stationary bike, participants power a five-tiered turntable housing vinyl records creating their own unique audio experience. 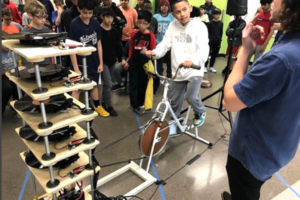 Visitors controlled the speed of the turntables by pedaling on the stationary bicycle, allowing riders to dictate the way the piece is experienced. 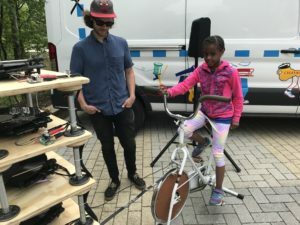 Community partners: Phoenix Bikes and BikeArlington Phoenix Bikes’ nonprofit youth bike education program and their upcoming new space on Columbia Pike at the Arlington Mill Community Center. BikeArlington is Arlington County’s bike education and encouragement program. 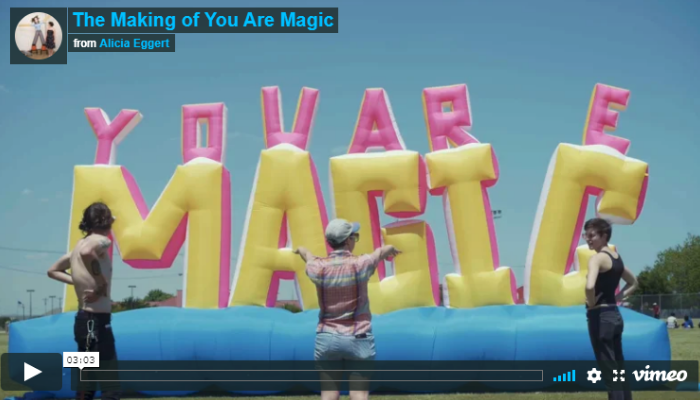 You Are Magic is a large-scale, interactive inflatable sculpture designed to inspire wonder and evoke the power of collaboration. When two people touch the handprint sensors and hold hands across the platform, the deflated sculpture comes to life. The inflatable fills with air, growing larger the longer participants hold hands, expanding into the words "You Are Magic." But as soon as they release their hands the circuit is broken, and the sculpture deflates into a crumpled pile of fabric on the ground. Community Partner: Volunteer Arlington connects individuals, groups, nonprofits and businesses in an effort to promote volunteerism. Volunteer Arlington is one of the four main offerings of Leadership Center for Excellence, whose mission is to enlighten, inspire and connect leaders through community building and leadership development. 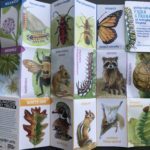 Going Native: Flora and Fauna of Arlington, Virginia, created and illustrated by artist Kate Samworth, is a folding, pocket-sized manual of some of Arlington’s native plant, mammal, and insect species of Arlington. 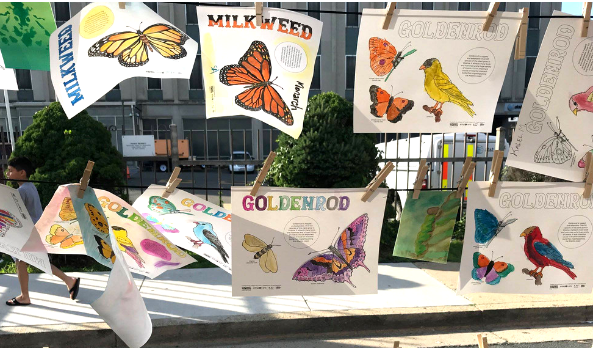 Using her artwork as a reference, participators enjoyed a quick hands-on art project examining and recreating the shapes and patterns found on selected species of plants, insects, and butterflies by using collage, watercolor and drawing. By doing this project it will help participators to identify these species and the ecosystems they support in their own backyard. 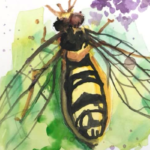 Community partner: Plant NOVA Natives, is the joint marketing campaign of a grand coalition of non-profit, governmental, and private groups, all working to reverse the decline of native plants and wildlife in Northern Virginia. Plant NOVA encourages residents as well as public and commercial entities to install native plants as the first step toward creating wildlife habitat and functioning ecosystems in their own backyards. 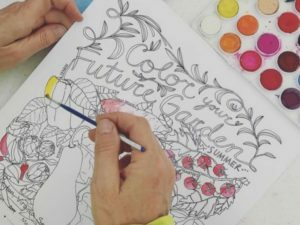 Marcella provided five different black line illustrations that you can choose to watercolor in your own way: an Arlington seed planting chart with an illustration of vegetables in one of the four seasons, or a map of the Arlington Community Gardens. Community Partners: Arlington Food Assistance Center (AFAC) with the Plot Against Hunger program. During the activations, visitors could grab some seeds to “Grow a Row” for Arlington Food Assistance or grab a plant and learn to grow edibles indoors. Artist Mark Pekala reimagined eight iconic Arlington business signs in his signature abstracted aesthetic. 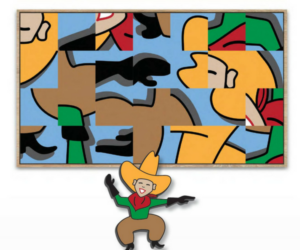 Mounted onto small magnetic sheets and broken into multiple 2x2 squares, the artists asks participants to let loose and rearrange them into new oringinal colorful abstract artworks of their own. One of these designs will be selected to become the new ground mural in Spring 2019 in the Pop-Up park at 2100 Clarendon Blvd. Community Partner: Inspection Services Division, Arlington County. Want to renovate your home or add on a deck? Talk to inspection services at these Arlington Art Truck activations! 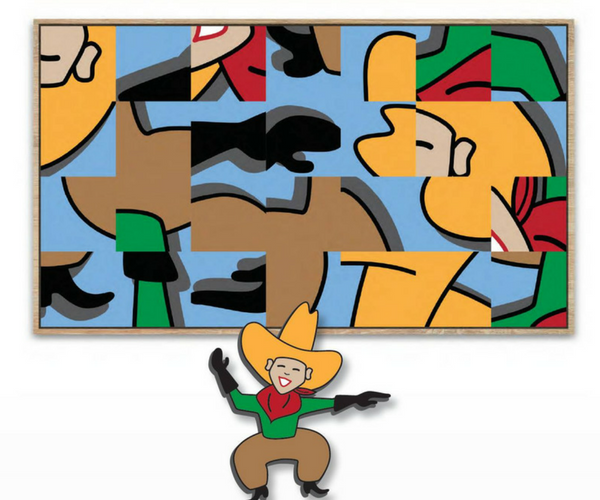 Read about the Arlington Art Truck's impact in the community on page 15 in our first edition of Arlington Arts Magazine. This project is supported in part by an award from the National Endowment for the Arts. To learn more about how National Endowment for the Arts grants impact individuals and communities, visit www.arts.gov.